Posted in Pork, Soups, on April 3rd, 2009. So maybe instead of wasting a paragraph of text telling you how I came about making this into a soup, perhaps I should just say – instead – I wanted to try this recipe for pork shanks and made it with more chicken stock and planned on making a soup. But I’d be lying. 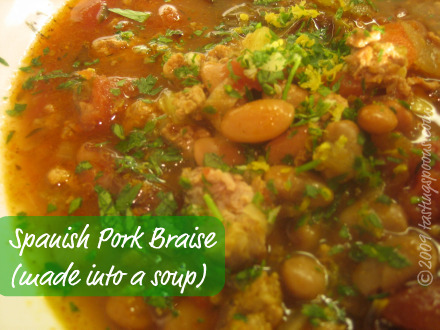 I wanted to make the Spanish Pork Braise which is kind of like osso buco, except it’s pork instead of veal. But after defrosting what I thought were pork shanks from our 4-H pig, I discovered the two packages were ham hocks. The packages said “pork shanks.” And the other package I thought was going to be nice smaller pieces of pork chunks, ended up being ground pork sausage. Sigh. So what to do? Improvise, of course. The recipe calls for all kinds of interesting herb and chile flavors, and they all sounded wonderful. I didn’t have prosciutto, so knew from the get-go I wasn’t going to add that. I cut way down on the beans since it was going to be a soup. I used pinto (pink) beans instead of garbanzo, and the gremolata I had was leftover from the night before made to go on grilled chicken. All the chiles and herbs added a lovely depth to the broth. The celery, onions and carrots gave it texture. The meats (both) gave it good flavor. The chili powder gave it just a little bit of bite, but not much. Perfect, actually. And the gremolata sprinkled on the top (you can barely see it in the photo) gave it a little zing. It went together easily enough, simmered on the stove for an hour or two (I made the beans from scratch in a separate pot), and provided a tasty repast with a nice slice of ciabatta to go with it. And I have enough for at least two more meals. Yes, I’d make it again and I’d double the amount of vegetables. If you would like to make the original recipe, head over to epicurious. There are a variety of other things added to their recipe. 1. PORK: In a large heavy-bottomed pan heat the olive oil until it’s shimmering, then add the chopped onion. Saute for 3-4 minutes until it’s translucent, then add the carrots and celery. Continue to saute for 5 more minutes, then add the garlic. Add the pork sausage meat to this mixture and saute until the meat is no longer pink. Add the fresh thyme, chicken broth, pork shanks (or ham hock), tomatoes, Sherry, chiles, tomato paste, chili powder, paprika, cumin. coriander and water. 3. Add the canned beans (or make them yourself and add them to the stew/soup mixture). 4. Remove the ham hock and cool briefly. Remove meat, shred and return to soup pot. If you have pork shanks, they may be served in the soup bowl, or you may remove them from the soup and discard the fat and bones, returning pulled pieces to the soup pot to reheat. 5. GREMOLATA: Finely mince the parsley, almonds and orange (or lemon) peel. Cover and set aside. 6. Taste soup for seasoning – add salt if necessary, and pepper to taste. Remove pieces of whole chile and discard. You may add other vegetables at this point if you’d like and simmer just until tender. 7. Scoop about 2 cups of soup into a wide soup bowl and sprinkle generously with the gremolata. Serve immediately. Per Serving: 657 Calories; 37g Fat (51.6% calories from fat); 49g Protein; 30g Carbohydrate; 7g Dietary Fiber; 160mg Cholesterol; 682mg Sodium.